Silicon Valley techie by day, singer by night (and weekends). This blog is about how I use technology to study, rehearse, and perform (mostly) classical vocal music. Opera singers get a brief mention in one of the online exhibits of the Exploratorium, a science museum in San Francisco. Now, it IS a really brief mention. And the scientific explanation is somewhat (over?-)simplified. But I guess you could use it to explain opera singer anatomy and acoustics to your kid! At any rate, I think it’s cool to see opera singers highlighted in a science museum exhibit in any way, shape, or form! Today I attended a choral concert where my companion and I noticed something rather mysterious. There were these big rectangular reflections on the acoustic shell behind the chorus. And the reflections would move around in a strange and distracting way. The reflections seemed too odd and random to be an intentional production element with the lighting. And I couldn’t see anything on the set pieces or in the stage lighting that would cause reflections or lights like that. The mystery was solved when my companion pointed out that the reflections disappeared when the singers put down their choir folders and then reappeared when they raised them again. We deduced that it must be the reflections from the screens of the singers who were using iPads or tablets – of which there were several. The stage lights were very bright, making the reflections fairly prominent. Unlike onstage iPad face-glow, I don’t know a good fix for this offhand. You can get matte anti-glare films for your tablet screen (here’s the one I use) and they certainly help with readability of the screen under stage lights, but I don’t know if they help with this kind of reflection. But it’s just something to be aware of and to try to avoid – an unexpected side-effect of tablet use onstage, that could add an unintended distraction to your ensemble’s presentation. Ever since I saw a commercially-manufactured magnetic iPad case that mounts on metal surfaces (the KICMount), I have been interested in trying to make one myself to use on a music stand. The iPad would attach to the music stand securely enough that I wouldn’t have to worry about minor bumps and jostles causing the iPad to crash to the ground. 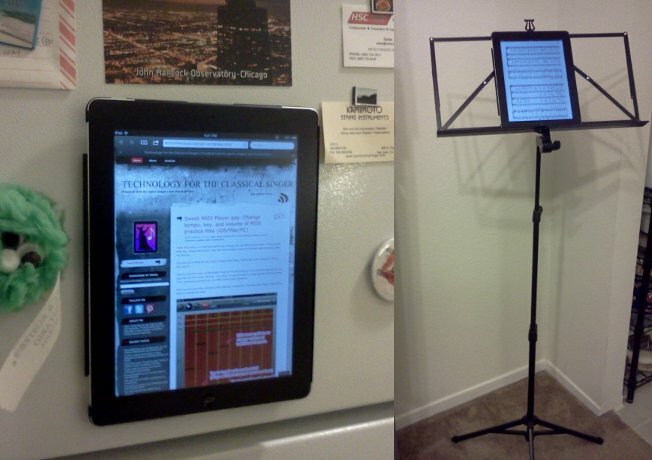 I could also safely pick up the music stand and carry it around while the iPad is on it. 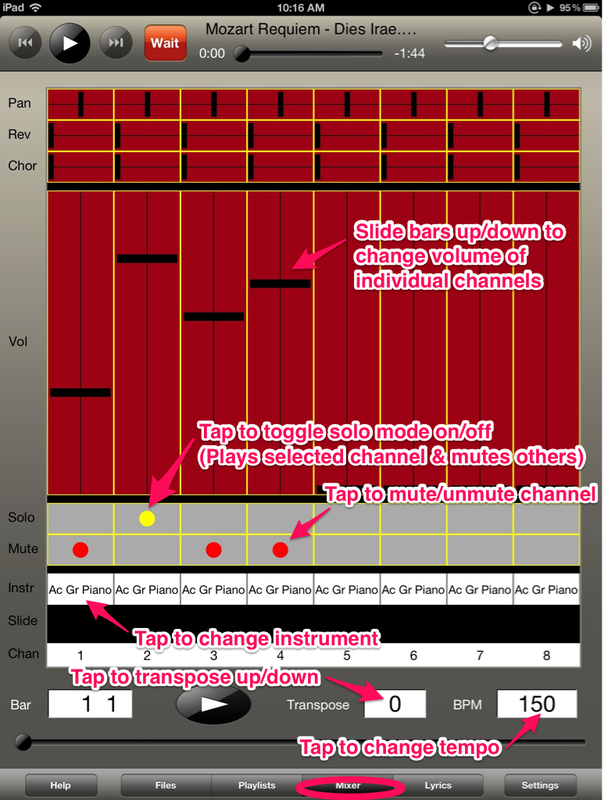 Sweet MIDI Player is a must-have app for any musician who uses MIDI practice tracks. 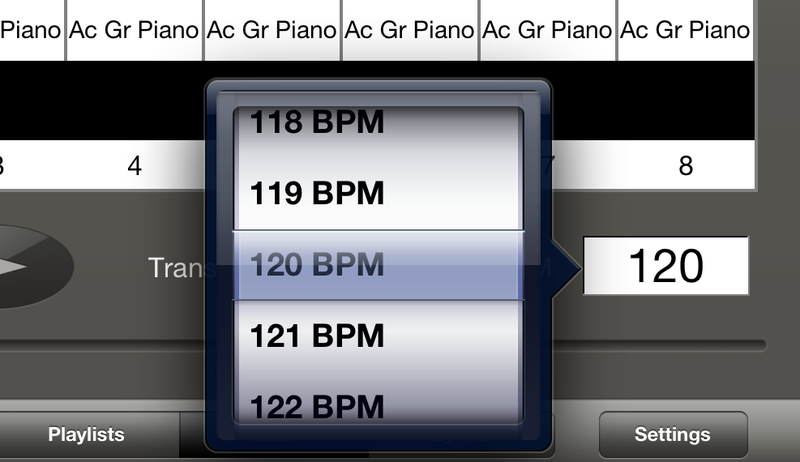 It lets you play MIDI files, change their tempo or key, and mute or adjust volume for individual parts (channels) within the MIDI file. 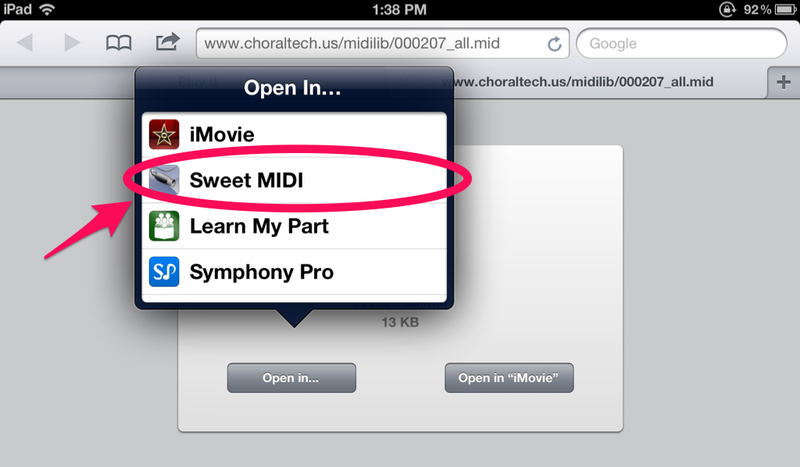 This blog post is about the iPad version of Sweet MIDI Player, but the app is also available for iPhone, Mac, and PC. 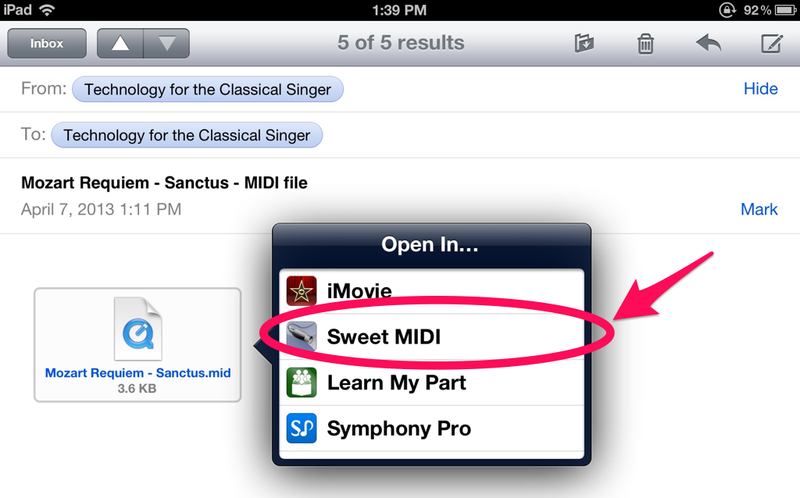 There’s a free trial version of Sweet MIDI Player for iOS which lets you try out all of the features, but only plays the first 75% of your MIDI file. From there, you can purchase an in-app upgrade to the full version. It’s a worthwhile purchase if you use MIDI practice tracks frequently. Note: If you change the key, tempo, or other settings, Sweet MIDI Player will prompt you and ask if you wish to save the changes. 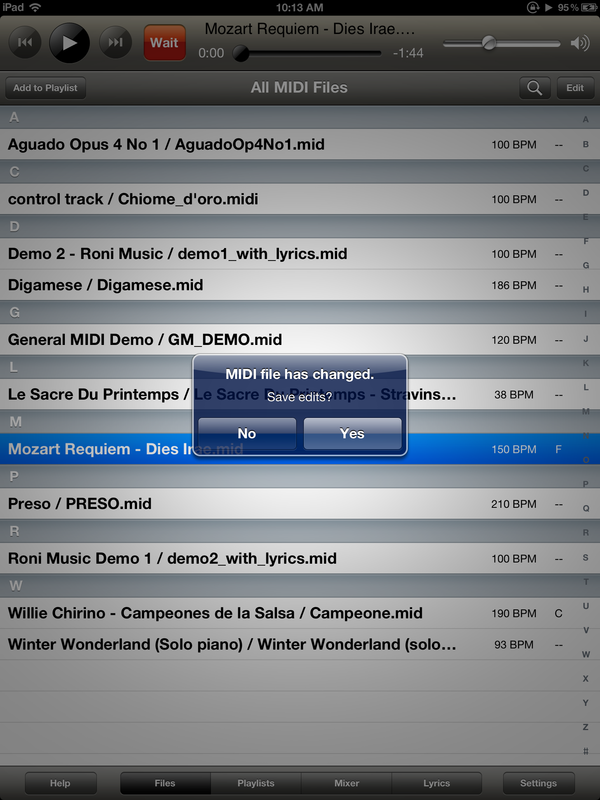 If you choose “Yes”, it will overwrite your MIDI file with your changes – so if you care about having the original MIDI file, be sure to make a backup copy of it before you use it in Sweet MIDI Player! The app also has a help page, accessible from the “Help” button on the lower left. 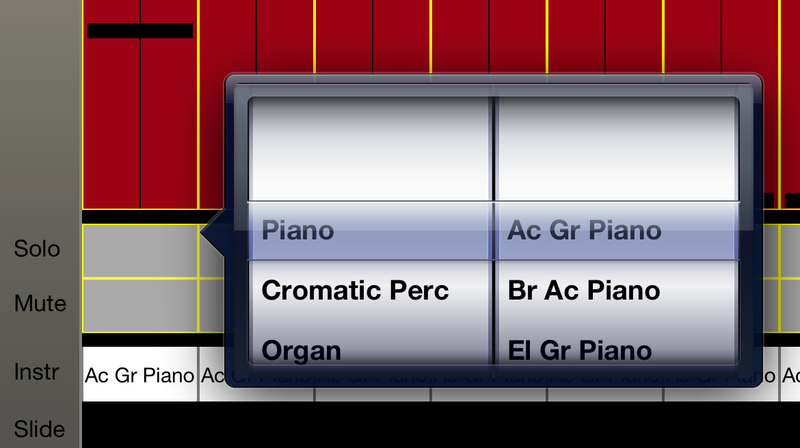 Sweet MIDI Player also supports background audio, which means that you can start playing a file, switch over to a different app (for example, a PDF score viewing app like forScore), and the the MIDI file will continue to play while you are viewing the score in the other app. 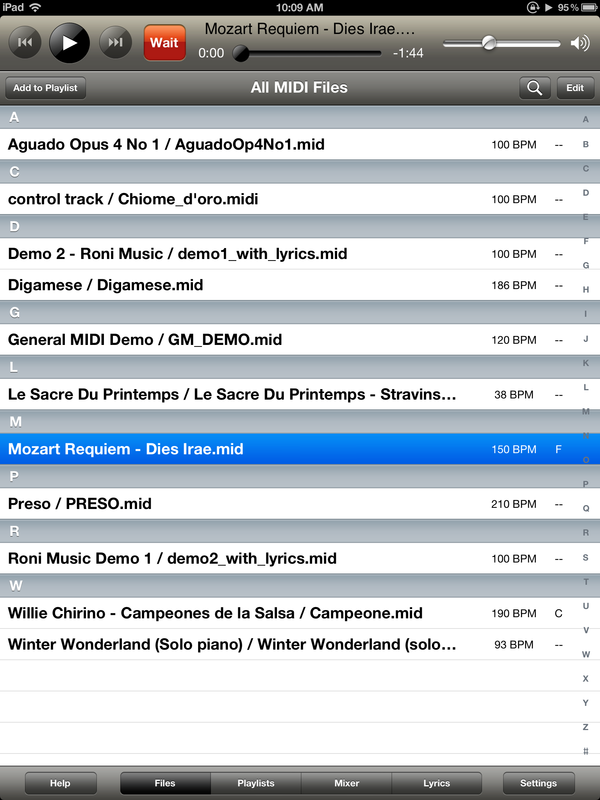 Once you’re back in the Sweet MIDI Player app, you should see your new file in the “Files” view. 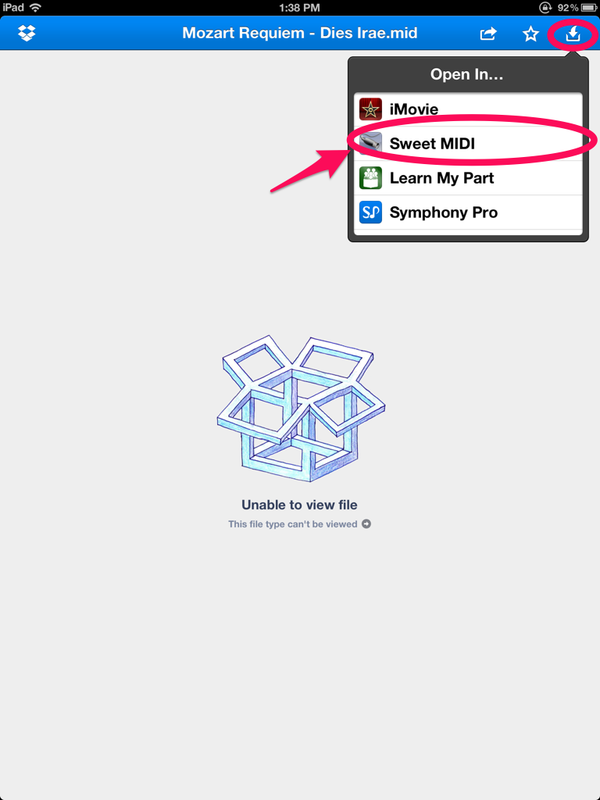 As of this writing, the Sweet MIDI Player app does not have direct integration with Dropbox, but you can still use the Dropbox app to import MIDI files from your Dropbox account. 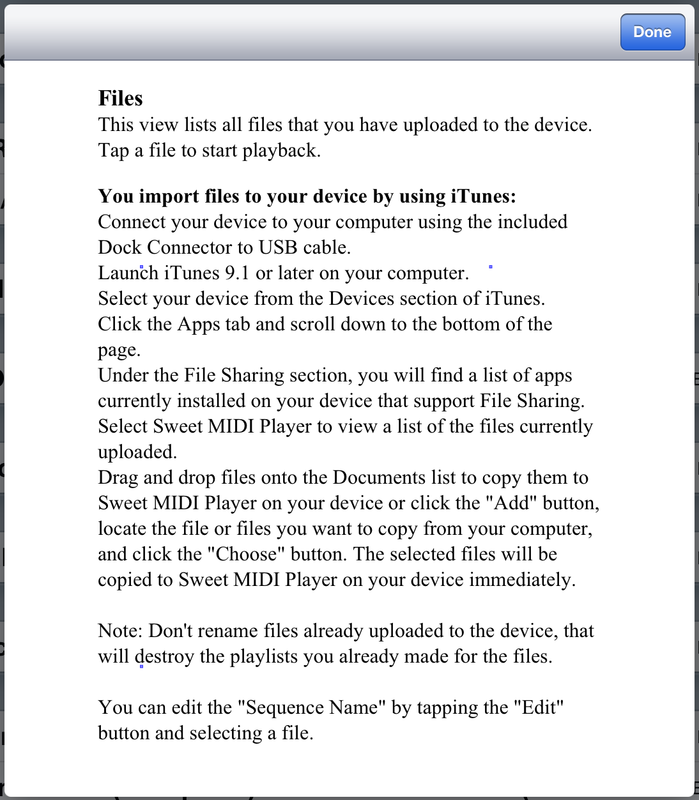 The help page for the app provides instructions on how to import MIDI files using iTunes. 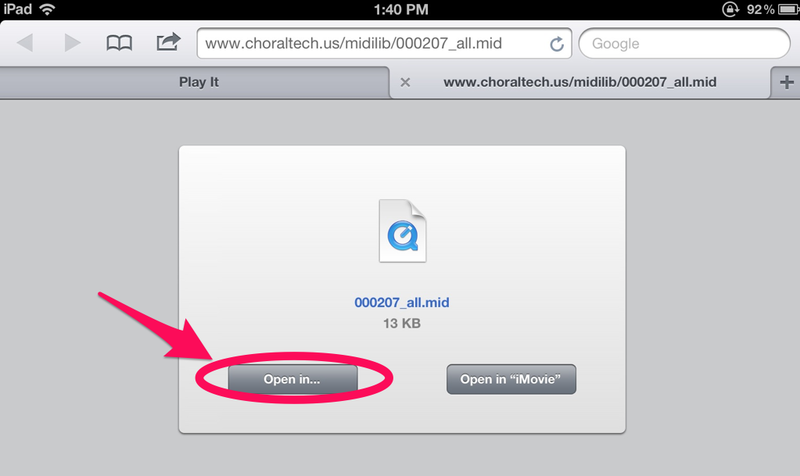 Personally, I find this method a bit of a hassle, unless I need to import a large number of MIDI files at one time. 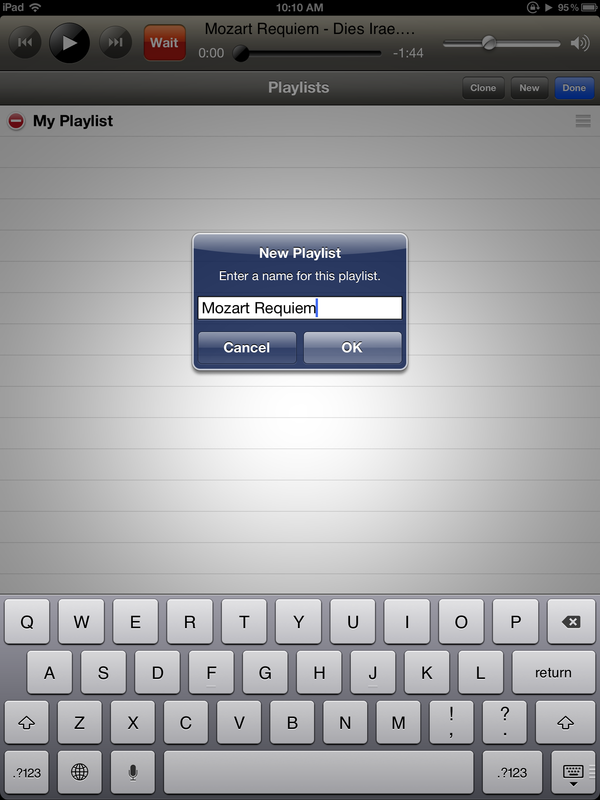 There’s another app similar to Sweet MIDI Player called Learn My Part. It’s specifically geared towards choral singers and also has the ability to repeat one section of a MIDI file and to import and view PDF scores. However, I still prefer Sweet MIDI Player because I find the controls easier to use and I like having the ability to transpose. What about MP3 accompaniment/practice tracks? Sweet MIDI Player doesn’t support MP3 files, but there are other apps such as Amazing Slow Downer, Riffmaster Pro, Anytune, Tempo SloMo, and AudioStretch that play MP3 files and allow you to adjust tempo and/or pitch independently. I plan to cover some of them in future blog posts. 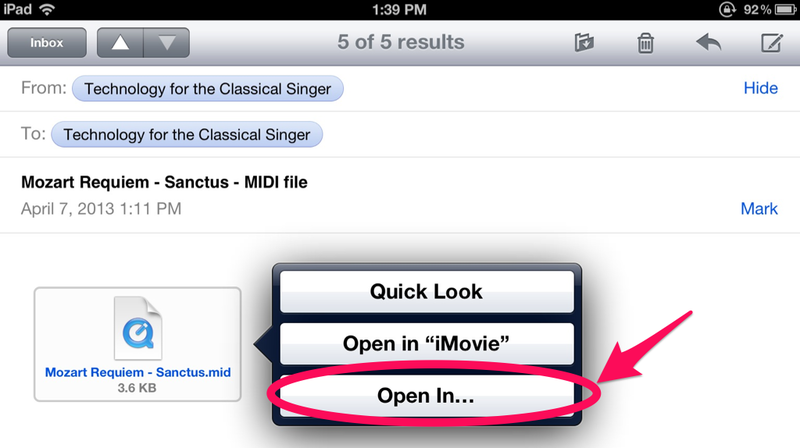 Remember, even if you’re not an Apple user, you can still access iTunes U content for free on a PC or Android device. This unit looks at the short poems in German that were set to music by Franz Schubert (1797–1828) for a single voice with piano, a genre known as ‘Lieder’ (the German for ‘songs’). Once they became widely known, Schubert’s Lieder influenced generations of songwriters up to the present day.This unit then discusses a selection of Schubert’s settings of Goethe’s poems, and recordings of all of them are provided. You can find the poems, in German with parallel translations into English and the music scores of four of the song settings, on the unit home page. You are not expected to be able to read the music, but even if you are not very familiar with musical notation, you may well find the scores useful in identifying what is happening in the songs. be able to comment on the relationship between words and music in Schubert’s song settings. The course was created by Dr. Robert Philip. OpenLearn gives you free access to learning materials from The Open University. We launched OpenLearn back in October 2006 thanks to a grant from The William and Flora Hewlett Foundation. Our shared vision was free online education, open to anyone, anywhere in the world. OpenLearn is the result and we have since reached over 23 million people. In the first two years, OpenLearn grew to include over 8000 study hours of learning materials from Open University courses. The website continues to grow with new course materials being published regularly in our OpenLearn ‘Try’ section. The Open University is a world leader in modern distance learning, the pioneer of teaching and learning methods which enable people to achieve their career and life goals studying at times and in places to suit them.